As we finished the last day of actual classes today, students scattered to the winds to have dinner and manage their last evening before their convocation at Jagiellonian University’s hallowed halls tomorrow. They will actually occupy a building and room (for a couple of amazing hours) that Copernicus sat in as a student. The comments on the three classes have been varied, but that is similar to what occurs in Centennial, Hardline, or Bakeless. The past three weeks have been sitting in the presence of international prestige and while there have been moments of cold as we walked the streets of Kazimierz, confusion as they tried to understand the plot or thoughts behind The Mighty Angel or The Piano Teacher, or wrapping their minds around the complexity of the Jewish question in Europe for the last 1,000 years, learning, as it always does, occurred sometimes when least expected. At dinner tonight with two students, they reflected on the fact that they learned as much outside the classrooms as in, but that the outside learning was profound in ways they did not anticipate. More will be said about that. Traveling to four countries with four currencies and four languages creates opportunities for learning about others, but more importantly, often more about oneself. I have been fortunate enough to travel outside the country a number of times in the last few years and, in spite of my increasingly growing elder stature, it seems I learn more each time. Some have asked me how I have fallen in love with Poland (and mostly Kraków) as I have and it is a complicated answer. I am amazed by the beauty and history of this city. I am comforted by the sense of coming back and knowing something about the city as well as specifics about the City Center. I am pleased by how genuine and kind the Polish people are and how polite and accommodating they are day in and day out. For me, this time I have worked to begin tackling the Polish language in a more systematic and complete way. It has been a learning experience as attempting to be able to use any other language is, but for me the most difficult part of Polish is pronunciation. In spite of the truism that you pronounce exactly what you see, the combinations of letters (mostly consonants) and the consonants and vowels with diacritic markings still has my mind somewhat boggled. I have, however, made more progress than I hoped, mostly giving credit to my tutor, Weronika. This evening at dinner and again sitting in Garbarska, I have asked students what their most significant learning moment was. It is not something they easily answer, and, in fact, often they have already realized just how consequential these three weeks have been in changing their perspective on a number of things. Michael Sowash, an honors student majoring in about everything, or so it seems, noted that this trip has pushed him to rethink most everything about himself and the world. Travel has a way of doing that, particularly when you are confronted 24/7 with another culture. It seems one of the most important learning issues has been the need to be able to communicate in another language (or two). The realization that many people their age are bi/trilingual has not gone unnoticed, and that is a very important and thoughtful reality check. A second realization for some of the other students is that they have been pushed to learn in areas outside their own Bloomsburg expertise, and in a different manner. There is not so much memorization-regurgitation here. The need to think and reflect in a critical way and to conduct some careful analysis (on the films for instance) has many of the students stumped. Students, whom I know to be strong students at Bloom, have asked questions that seem like the simple “give-me-a-recipe” sort of request, which is not something I would expect, but it illustrates the difference from what they have grown comfortable with in their own classes. The second class on Central/Eastern European Film, Literature, and Culture has been an eye-opener for students in a variety of ways. Film studies in Poland are very different because the nature of the films and the industry is not what students are used to in our Hollywood culture. There is no set of film actors who make tons of money on the next big blockbuster film. As noted in a previous post, there is a sort of dark and morbid realism in cinema here. There is no amazing musical score or stunning cinematography. There is no Robert Redford narrating the role of a traditional family like what he did in A River Runs Through It. There is again the issue of language in that with one or two exceptions, students are dependent on subtitles, and many of the subtleties are thereby overlooked or unapparent. This will make analysis a bit more difficult, but it forces students to be more critical and analytical to come up with a reasonable paper. There is also the issue of understanding research and what is expected when the two people from whom you are learning are considered to be one of the best in their field (and that is globally). It is a bit intimidating, but both professors are kind beyond words if a student asked for help and provides a strong and thoughtful effort. It was my hope to finish this yet tonight, but students stopped by the little room here on second floor Garbarska to consider the trip and it is in my asking questions of them, I am able to write this entry. For the night, however, as it is 12:59 a.m., I am going to try to get a bit of sleep before I get up to work on Polish again and then work through the day. By this time tomorrow night, most of the group will be down to hours before they head to an airport. Amazing what has been learned in our 24/7 classroom thus far. More will happen again tomorrow. Why? Because it is Poland and students are away from home and have been for the better part of a month. One said today, While I am sad to leave Poland, and I really wish I could stay, I am really to be home. Then, they added, but it will never be the same. Good morning after about 6 hours of sleep. I will admit my body wanted more sleep, but there is so much to accomplish today. The need to be up and going over-ruled the desire to continue pushing the snooze. Today’s agenda includes: having breakfast with Dr. Polyuha at Bydgoska, which is about a half hour walk from here, working on my Polish before today’s tutoring, attending convocation with our students, getting business cards out to a couple of people to whom I promised such, being tutored one last time while I am here in Kraków, having dinner with Maciej, our film professor, arranging some important details before I get to JFK, and being ready mentally and physically for a really long day tomorrow. Returning to the learning that has occurred over the past 24 days, the most interesting thing about these journeys is the greatest learning moments will be realized long after the wheels of a plane have touched down, long after souvenirs or gifts have been bestowed on family members or friends, and perhaps years later when an event brings a specific memory of Budapest, Wien, Praha, or Krakowie seems to be conjured up at that moment. I know this is true because it is 36 years since I first traveled on a similar trip as a sophomore in college. Speaking with students in the two days since their journey to Auschwitz, some have noted that being there is an experience that can be compared to no other on a trip filled with experiential learning that is unexpected. To even move one’s feet across the same hallowed ground as one student noted was overwhelming. All attempts to understand the complexity of the little town of Oświęcim and how it became more well known as Auschwitz has a long history. The intersection of the German and Polish people precedes the macabre site of the death camp by centuries. That is another learning point for students. Realizing the length of history that underpins this area, particularly when compared to their typical American mindset, is something that takes some careful thought. Today will be an interesting day because most students will begin to disengage from their 24/7 classroom, but they will be a sort of limbo state trying to process what they have lived for the last three-plus weeks. There will be a desire to experience everything possible in the next 24 hours and yet the desire to get back to what is familiar, from their own bed to a breakfast they understand (that is the one meal many of them struggle with the most, which is interesting to me because most of them are never up for breakfast at school). Leaving everything behind is not really possible because there are final papers to write and submit, which are due at the end of the month. Next Monday, with the commencement of spring semester, their lives will be back to some kind of normal, but the people they are is much different than the group of people who gathered at JFK on the 26th of December. I want to personally thank Drs. Orla-Bukowska and Stroiński for their unfailing willingness to work with our students. I want to thank Dr. Ewa Nowakowska, the program coordinator, who is gracious beyond words, and Mikolaj Borkowski, who has so ably assisted us for the last two years. 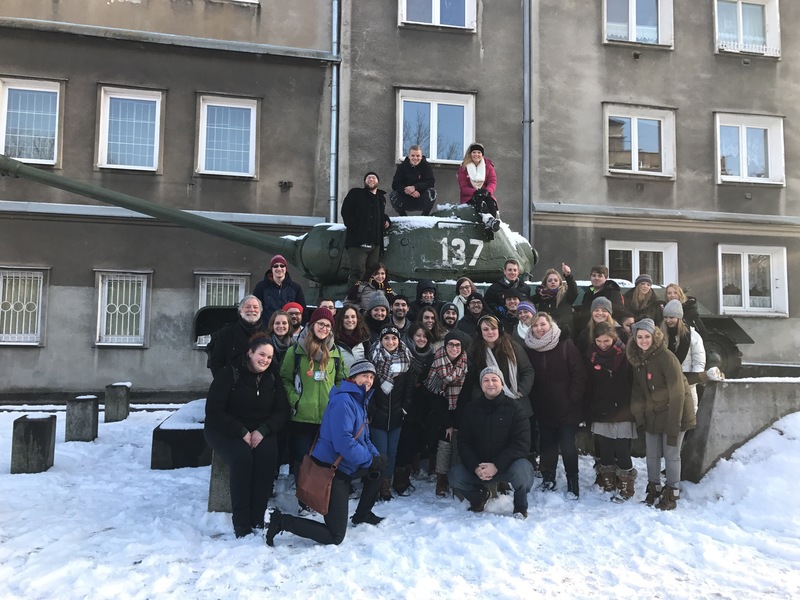 It is not often that your class takes you to a city called Nowa Huta, which was designed by Jozef Stalin to be the ultimate communist city, nor is it often that your group picture is on a Soviet T-37 tank. Well, learning will occur and processing of that learning is just beginning, but until the next entry . . .
Do widzenia and thanks for reading. Next Post Where has 40 years gone?